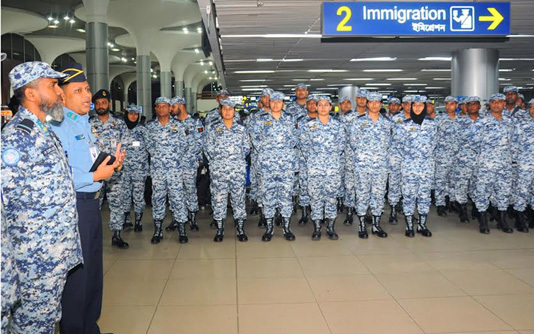 Bangladesh Air Force (BAF) is going to replace its 3 contingents consisting of 358 members including 10 female officers at United Nations Peacekeeping Mission deployed in Democratic Republic of Congo (MONUSCO). Presently 3 BAF contingents in DR Congo will be replaced by new contingents, said an ISPR release here today. As a part of this replacement 202 BAF members left Dhaka for Congo on Friday by UN chartered aircraft. The rest contingent members will depart for Congo by phases. These contingents of Bangladesh Air Force are comprised of Utility Aviation Unit-16, Air Field Services Unit-16 and Air Transport Unit-9 and led by Air Commodore S M Muied Hossain, Group Captain Md Readad Hossain and Group Captain Mahmud Mehedi Hussain respectively. Bangladesh Air Force has achieved good reputation and glory by performing their duties in mitigating conflict with efficiency, professionalism and sincerity in DR Congo. Special munajat was offered seeking more excellence of the contingents in future at departure lounge of the Hazrat Shahjahal International Airport (HSIA) prior to their departure for Congo. Senior BAF officers were also present at the airport during departure. Earlier, Chief of Air Staff Air Chief Marshal Masihuzzaman Serniabat briefed the contingent members at BAF Base Bashar on November 29 and offered special munajat for the success of the mission. While addressing, Chief of Air Staff advised them to discharge their duties with honesty, professionalism and sincerity and bring honour for Bangladesh Air Force as well as for the country.